At USBid, the procurement of hard-to-find or obsolete electronic components demands stringent quality practices in all aspects of our business in order to deliver products that exceed our customers' expectations. Quality is the process of building a relationship with our customers -- and is measured by when they come back and the products don't. The key to our high quality standards begins with our AAA Test Lab, or AAACTL, designed specifically to provide counterfeit avoidance assurance for electronic components per IDEA-STD-1010-B, CCAP-101 and AS6081. For more details on USBid's quality test and inspection techniques visit the USBid YouTube Channel and the USBid blog on Counterfeit Avoidance Procedures. Certifications - USBid's commitment to quality is backed by third party certifications and industry affiliations. We actively maintain certification requirements and continue to look for additional standards to promote the highest level quality products and services to the market. Inspection Process - Rigorous visual and physical inspections per IDEA-STD-1010-B guidelines to verify product conformity to manufacturers' specifications. 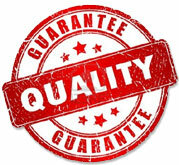 Warranty - USBid warrants the form, fit, and function of all parts bought on our site for a period of one year. Buy and sell with confidence. USBid has a positive reputation and proven track record for delivering quality electronic components. Counterfeit Avoidance - The prevalence of counterfeit parts in today's marketplace requires more vigilance by all parties involved in the electronic components supply chain. This is especially true for military parts and space related applications where more rigorous standards are required. QTSL/QSLD Qualified - The QTSL and QSLD accreditations certify USBid to supply the U.S. government, military and government contractors with Federal Stock Class (FSC) 5961 and 5962, military & commercial grade products, as stated in the Criteria and Provisions document for the QTSL/QSLD programs.